Reimagining education doesn't stop at an accredited online and/or blended-learning degree, many students find ways to incorporate accredited online classes into their current degree program. 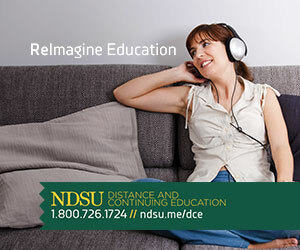 Students enrolled in an on-campus degree program at other universities, may choose to take online classes through NDSU for improved time to degree. High school students may choose to enroll for early entry or dual credit online classes to get a head start on their college education. Check with your advisor to ensure the online class will apply to your program of study. Individuals interested in building their professional skills may also enroll in individual accredited online classes as a non-degree seeking student (limit 15 credits at the undergraduate level, no limit at the graduate level). If you are interested in beginning an accredited NDSU online or blended-learning degree or just want to take a few online classes, please review our Getting Started Guide. For answers to additional questions about online degrees and classes you may find it useful to view our searchable list of frequently asked questions. If you find an online or blended-learning degree that may assist your family member, friend, or colleague in reimagining their education, don't forget to tell them about our accredited online degrees and classes. NDSU online degrees and blended learning degrees are accredited by the Higher Learning Commission. In addition, many programs are accredited or approved by their respective professional organizations and agencies. View NDSU's Accrediting Agencies.